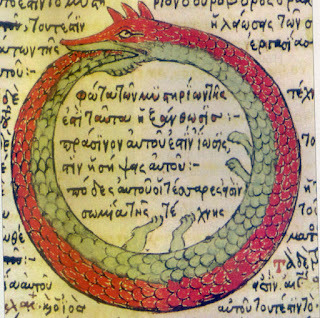 The proverbial ouroboros, the cyclical snake eating its own tail. Languages are fascinating. If they weren't, I wouldn't have spent years learning about them and then writing about them. However, an odd thought popped into my head the other day. Without languages, I wouldn't be able to talk about languages, nor would I have anything to talk about. 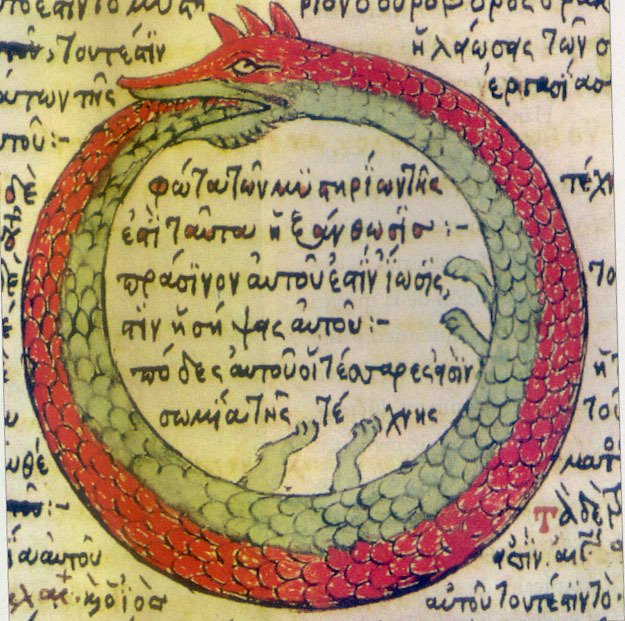 While we could sit and debate the ouroboros nature of language and thought for years (which people have already done and it's fascinating! ), I would rather look at which words in English are commonly used when talking about language to see how we like to refer to this wonderful phenomenon. I reckoned the best place to start would be with the words that commonly collocate with the word "language" in English in order to see if there were any patterns related to which words we use to talk about the fact that we talk. When we describe languages, we are seemingly very interested in the time and place occupied by a language. We have to describe when the language was being spoken and whether it is still being spoken today. When discuss whether a language is still commonly used today, we either speak of a dead or a living language. In the case of dead languages, we like to describe them according to the historical period in which they were used, calling them either ancient or classical languages, for example. Of course, languages that are living are often called modern languages. Where a language is spoken is also key. Languages, like peoples, can be indigenous to an area since people like to bring their languages with them when they migrate. Sadly, the term "indigenous" is often used to describe languages that are endangered due to replacement by more prestigious languages in their areas. How much a language is used seems to be another common trend when referring to languages. We can talk about international and national languages, or on the other end of the scale, minority languages. Use in terms of speakers isn't the only way we talk about languages and their speakers. We also like to know how information is being communicated. We can talk about spoken language, written language, and, in the event of corporeal communications, body language. In addition where and when languages are used, we're clearly interested in the situation and context in which languages are used. Some of the most common collocations include formal and informal language. The discussion of domain is also very common, such as referring to flowery, literary, and poetic language. Unfortunately, other commonly mentioned contexts include racist and sexist language, unless we're often condemning them. Bad, crude, offensive, obscene, offensive, and strong language are all used regularly in English and make up some of the most common collocations. It seems that as much as we hate bad language, we can't stop talking about it.